You don’t always have to travel to get great food and service in Shenzhen, though often you do. Love Life however is fantastic and less than a minute’s walk from home too. It’s a Cantonese style restaurant with an upmarket feel inside. The interior is decked out in faux dark woods and there are plenty of big comfortable chairs to relax on while you drink away an afternoon or work your way through the menu. It’s worth noting that before you go the only alcohol they serve is Tsing Tao beer, which is available in big bottles (well chilled) for 10 RMB a pop. If you prefer wine or other drinks with your meal, don’t let that put you off the restaurant is perfectly happy for you to bring anything you want with you and there’s no corkage charge for drinking inside. If you forget, then of an evening, there’s a little wine bar next door which is open (oddly) between only 7 p.m. and 10 p.m. every day and they’ll happily sell you a bottle and lend you glasses to drink it from too. My friend Pete does this regularly. As with pretty much everywhere in China it’s a smoking restaurant with no non-smoking sections, but don’t let that put you off. Unless we’re in there for a few afternoon beers, most people don’t smoke heavily. The menu is easy for laowai to navigate, given that it’s all in pictures. We can recommend the Char Sui Pork, which while a little fatty is covered in as sweet honey glaze that makes it perfectly contrasting in flavors and textures. The duck comes with a fantastic plum dipping sauce and is genuinely excellent too. Watch out for the chicken though, you’ll need to be able to speak Chinese to get it right – it usually comes cold, and undercooked (curiously this is nearly always the case for chicken in China) and unless you like frozen and bleeding poultry you’ll want them to warm it up and cook it through for you. If you do this, then it’s also very good and the sage, onion and garlic sauce that comes with it, is to die for. If you can’t get that over because your Chinese isn’t strong enough, then opt for chicken wings instead which are always hot and cooked through. 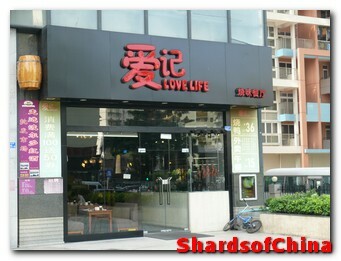 Love Life is good value too, with a meal for two including a few beers rarely costing more than 150 RMB. The owner is a very pleasant lady and will be only too happy to meet your requests (as long as they’re in Cantonese or Mandarin). She often cooks us an off menu roast potatoes, bacon and garlic dish which is just mouthwateringly wonderful and she ensures that meat is deboned prior to being served and that (if you know China) is a really big plus too. 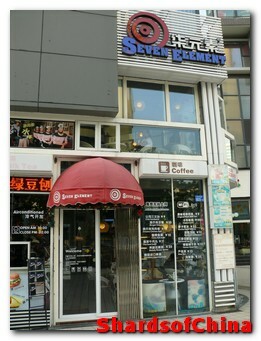 One of the great joys of living in Shenzhen is the proliferation of restaurants on every corner and every street. Within walking distance of my house you’ll find well over a hundred places to eat, and there must be tens of thousands of establishments across the city. It’s not living in the UK either, food is not generally expensive though it can be – particularly in Western style establishments and in high end Chinese places. One of the local fast food chains I like to frequent is the Muslim restaurant, there are several of them dotted around the city but the one I go to is the one that is opposite my house. When I’m feeling particularly lazy I’ll get my wife to call and have them deliver (at no extra charge) but usually I’ll just wander over and park myself there. 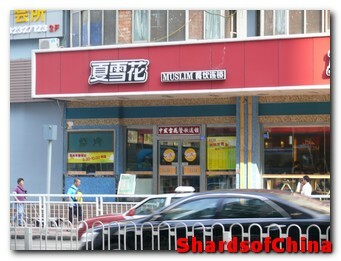 The Muslim Restaurant in Shenzhen is a chain and you can find them pretty much anywhere, but this is the one in Luohu near the old Days Hotel. The reason “Muslim Restaurant” is in inverted commas in the title is because they don’t quite seem to have sussed out what Muslim means. So while there’s no haram food on the menu (it may be one of the only places in Shenzhen to have no pork whatsoever), they do serve beer which is just fine with me. The beer is cheap too at only 7 quai for a large (1 pint) bottle of Tsing Tao. The food isn’t bad either; my favourites include potato cakes (kind of a small bun stuffed with mashed potato and onion), the spring onion bread (rather like a cross between a pancake and a Yorkshire pudding with loads of chopped spring onion inside) and kebabs. The kebabs are a particular delight in that they are spicy without being killer and are extremely good value at 4 RMB each (lamb or chicken). They also serve some excellent lamb jaozi (dumplings) which are steaming hot and come with Chinese vinegar for dipping them in (which is also packed with garlic) at 15 RMB. And if you just want something similar to home there’s a beef in black pepper sauce and rice which actually looks like something you’d find in a Chinese takeaway in Basingstoke (or the like) and is cracking value at 15 RMB (as you won’t need anything else once you’ve eaten it). The interior is a tad basic and reminiscent of school cafeterias but that’s true for 90% of all restaurants in China, but the menu is wide, varied and best of all comes with pictures of everything they sell so you won’t need any Chinese to order from it. The staff are friendly and welcoming too, the only downside is that they’ve now banned smoking on the premises (one of the very few places in town to continue with the ban following the Universiade games), so I have to stand outside to choke one down between courses.